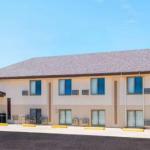 The Super 8 Bowman is arranged over two floors and has 31 non-smoking rooms all with free Wi-Fi and flat-panel cable TVs. The free continental breakfast of cereals pastries fruit and juice is great way to start the day. Parking is free and pets are allowed for an additional fee. The hotel is off U.S. 12 on the southern border of the town of Bowman and is less than a half-mile from U.S. 85. Restaurants and local bars are within a five-minute walk. Theodore Roosevelt National Park is 90 miles north on I-94. Sloulin Field International Airport is 170 miles from the hotel.